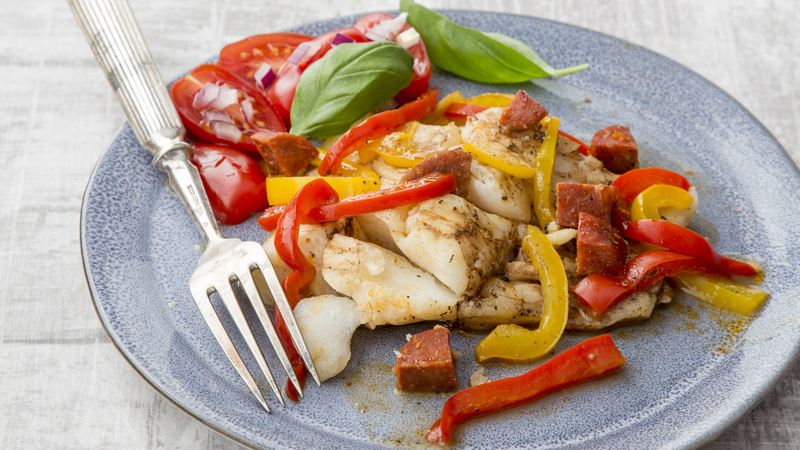 These cod and chorizo parcels can be prepared the day before, stashed in your fridge and baked when you get home from work for a nice easy supper. 1. Preheat the oven to 200°C/gas mark 6. Tear off four very large rectangles of tin foil (60cm x 40cm). 2. Grease each piece of tin foil with 1 teaspoon of the oil. Put a cod fillet in the centre of each piece, then divide the peppers and chorizo between the four parcels. Season with salt and pepper, then drizzle 1 tablespoon of balsamic vinegar on each one. Fold the foil from each corner to form a pouch and tightly seal, then place the parcels on a large baking tray. 3. Bake in the oven for 15 to 20 minutes, until the fish is cooked through. Remove from the oven, taking care when opening the foil pouches as the hot steam escapes.